Contents: Rice, beans, a mix of ground beef and potatoes, and water to drink. 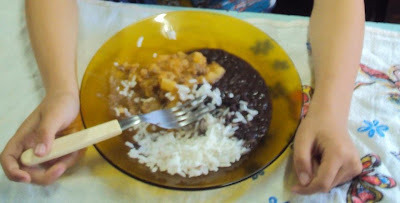 Notes: You haven't had rice and beans until you have had Brazilian rice and beans. Delicious. Almost sure this meal was on a day that lacked an assortment of groceries/produces...yet it looks very tasty. You go, Brazil!